Size103,000 Sq. Ft.| New building addition and renovation | Provided complete electrical, fire alarm systems and building systems relocation. 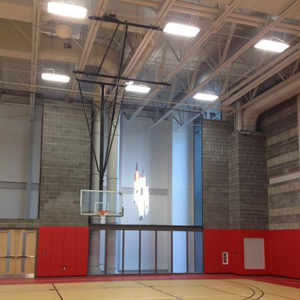 To provide students with expanded recreational facilities, King’s College constructed the new Scandlon Gymnasium that included three multi-purpose indoor courts, new athletic department offices, a multi-purpose classroom, a conference room, a sports medicine clinic, as well as the renovation of the existing facility. In order to be ready for the Fall semester, work was conducted during the summer recess and completed in a tight timeframe. Urban Electric provided complete electrical and fire alarm systems scope of work, along with relocating the existing building and utility systems.